Weddings should be all about the bride and groom. As the bride, you want a dress that shows off your personality and style and that could mean looking for vintage wedding dresses. Vintage clothing official means anything that has been owned previously but looks great throughout the years and keeps its style. However, most people take the meaning from vintage wine: something that’s old. You could ask your mum or grandmother to wear one of their wedding dresses. You instantly get the vintage style without having to spend any more. However, that only works if you want to use something that is in the style that you want, has been looked after and fits you. While you can have bigger dresses taken in, it is much harder if your mum or grandmother were smaller than you. Here are some vintage wedding dress ideas from throughout the years. It can be difficult to find some and you may actually need to look under gothic wedding dresses—apparently Renaissance and Victorian styles are gothic—but there is something that will suit your style. The 1950s style was all about fun and the dresses were comfortable. I love this white dress, with its full circle skirt that screams the 1950s. The bust area of the dress has frills that look like there is another layer to the dress. It’s doesn’t have any sleeves and is a shorter style, making it perfect for summer weddings. If you want it for a winter wedding, you’ll have to think about a shawl or jacket to go over the top. This can be difficult trying to keep the 1950s style. I suggest wearing a pair of white heels with the dress and showing off your legs. Open-toed heels look great but you could also opt for round-toed heels to keep the vintage look. If you have long hair, tie it up in a high ponytail as they did in the 1950s. This is another of my favourite dresses with a 1950s style. One thing that I like about this vintage wedding dress is that it comes in different colours—there’s no need to opt for a traditional white dress if that isn’t something that interests you. Have a beautiful romantic red, a bright, turquoise blue or even opt for a black wedding dress! The bow on the left-hand side gives it an extra 50s touch. The bodice and skirt will suit most sizes and shapes, which is an extra bonus. Like the dress above, I’d suggest having your long hair up in a high ponytail. Find a ribbon that matches the colour of the dress to add to your vintage look. When Kate Middleton married Prince William in April 2011, everyone wondered what her wedding dress would look like. I was pleasantly surprised to see that she didn’t wear a big, Princess style wedding dress. She went for elegance and simplicity with the Grace Kelly wedding dress. 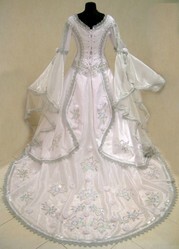 This is one of my favourite vintage wedding dresses for its beauty. It has a simple white under-layer with a lace over-layer and comes with a lace cropped jacket. A white ribbon sits just under the bust to draw attention to this part of the body—usually smaller than the waist! The back even has the button down to the hips, giving it the 1940s style. The one benefit about this listing on Amazon is that the dress is made for you. What more could you want for your wedding day? If you have long hair, try out an elegant hairstyle to work with the dress; however, Kate Middleton proved that you can also keep it down. Are the Victorian or Edwardian eras ones that interest you? There are some great vintage wedding dress ideas from these periods, whether you want something traditionally white or something with a little more colour. 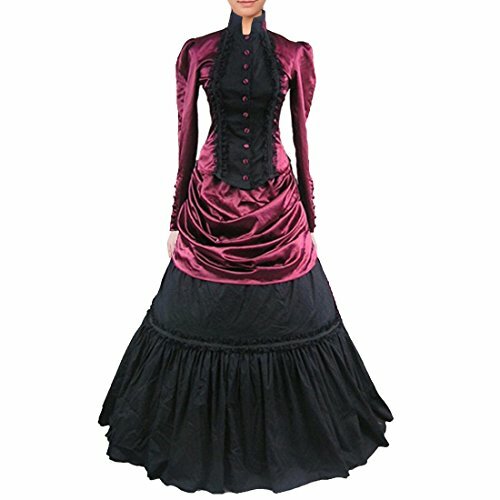 Many of these will usually show up in a search for gothic wedding dresses, though, especially if you want something in blacks, reds and greens. For those who love something with a high neck and a little bit different, this Victorian style dress is perfect. The sleeves give it an Edwardian twist but the rest of it is definitely Victorian—and something many would have warn for elegant parties and events. It also comes with a matching petticoat. One of the best things about this wedding dress is you can opt for black boots, instead of the traditional white heeled shoes. Boots with a small heel were traditionally worn by the Victorian and Edwardian women. When it comes to hair, try wearing it pinned up on your head. If you search for Victorian hair ideas, a lot will pop up and are great to try. If that dress is too dark, why not try this beautiful red and white number? The blood red colour will really make you stand out and be the true centre of attention on your wedding day. This dress does have short sleeves though, so you will need to find something to cover up if you’re getting married in winter. To good thing about this era is it’s easy to get a cape or jacket to suit the vintage wedding dress style. For those with long hair, I’d suggest trying ringlets. Whenever I see this dress, I think of the young women in Pride and Prejudice, with their beautiful ringlets gained from rags. It’s a hairstyle I’ve never mastered but would love to get right one day. So pretty and charming! This beautiful silky 100% polyester crochet shawl features flower pattern crochet with tassels around the edge. My final section on vintage wedding dresses moves into the renaissance period. This was the period that I chose for my wedding dress and don’t regret it for a moment. I only found my dress by chance when I was doing some research on gothic wedding dresses for a private client. As soon as the dress of my dreams popped up, I had to have it. I loved the white dress with the black damask detail on the hood, sleeves and body. It really brought out the 16th century look that I’ve always wanted to have—if you haven’t noticed by my history articles, I’m a big fan of that time. The hood as part of my dress was my favourite part. The only thing I’d change if I did it again is that I would lose weight and have a dress that pulled in at the waist more but there was nothing I could do since I’d had my daughter a couple of months before this. I’d suggest leaving your hair down if you’re going to opt for a dress like this. If you really want it up, try pushing it to one side. Accessory wise, you only really need a necklace. My mum and sister were lucky enough to find a black choker that had the 16th century style to match the dress. I have seen this same dress in different colours. Below are some great options from eBay! If you really want the medieval style and don’t care much about your budget, this one is an excellent option. It is beautifully embroidered with silver so you will glisten down the aisle. The front also has some delicate details, which will make you look like royalty for the day. The only downside for me is that there is no hood but you can always by a cape in the same vintage style that has the hood included. You could get away with any type of shoes underneath the dress. I’d opt for a pair of white heels but you could wear flats if you’re worried about getting down the aisle. Like the dress before, try keeping your hair down or you could get a stylist to try out one of the medieval hair styles with plaits and twists. Those are just a few vintage wedding dress ideas. There are a lot to choose from and many places to buy them. There’s no need to spend a lot but it will be worth it for the quality and comfort throughout your wedding day. You don't need to opt for a white wedding dress; with the vintage styles, you could opt for any colour you prefer. Remember that white wedding dresses only became popular because Queen Victoria wore one when she married Prince Albert! Before that, reds, golds and purples were commonly used. I literally just put "gothic wedding dresses" in eBay and searched through them. I was actually searching for work and just happened to come across my dream dress style so snapped it up. I really like the Medieval vintage wedding dress, my wedding next year is Irish Celtic theme and this dress would be perfect. Where would I get the specifics on it (ie: prices, sizes, etc)? Simply beautiful. Your wedding dress was certainly unique! I guess pretty much anything goes these days, which offers the couple a chance to be totally themselves. Thank you! I was really surprised to find mine at less than £100. I was expecting to pay thousands to get the dress of my dream--I honestly thought I was going to have to get it handmade. I love your wedding dress and some of the other selections here as well. The prices that show on some of the dresses you featured are incredible, considering how nice the dresses look.